Delighting in the different, the daily, and the divine. This is the photo Henry chose for his first day of 1st grade. Goofy smile. Not looking at the camera. Next to a freshly painted fire hydrant. It’s not what my instincts would choose. I’d have him sitting on the front porch with his hair parted just right. His smile would look effortless. He wouldn’t wear socks with his sandals. But he’s never been a “sit on the front porch on the first day” kind of guy. He’s got too much going on in his head to put up with my nonsense. Some forms of letting go are easier than others. Letting him choose his first day picture pose – or not pose for one at all – has been an easy one. Others are difficult. I know this; you know this. Trusting God with our children isn’t easy, despite the fact we know he is for us, we know he loves us, we know he loves our children. Why is it difficult? I think we hold tightly to our children because, in some measure, trusting God means trusting other people. Trusting teachers and assistants and principals will have the students’ best interests in mind. Trusting other children to be kind. Trusting our children to live with integrity. Even for those of us who trust others automatically, this is hard stuff. We value nothing more than our children. Handing them over is more weighty than a truckload of gold bricks with diamonds spilling over the top. So, we may watch them climb the bus steps or walk through the school doors with some reluctance, wistfulness, and questions. That was me on Henry’s first day of 3-year-old preschool. 4-year-old. 5-year-old. Kindergarten. Only on the first day of first grade did I relax. Over time, through challenges and even failures, we see God’s goodness displayed in our own lives – not just played out page after page in our Bibles, which should be enough for us but somehow never is. We’re imperfect humans with spiritual amnesia, after all. But if we live long enough, we do learn. We learn it’s ok to trust. It’s ok to give others responsibility. We really can let our children go. Trusting God completely means realizing he will fill in the gaps and redeem the mistakes. God, I know you will meet all Henry’s needs according to your glorious riches in Christ Jesus. In a few weeks Henry will start second grade, and I will snap a photo in the way he chooses. I treasure our first day pictures more than any staged picture we’ve ever taken. In the sweet little back of a toddler, in the smiling eyes of his compassionate teachers, and in the big boy’s smirks and toothy grins, I see the mercies that are new every morning. New here? Glad you made it! 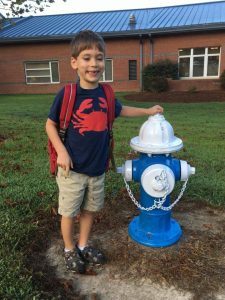 I write about my unique joys and challenges as Mom to Henry, a smart, tender, quick­-witted, train-loving, autistic 9-­year­-old with an infectious smile. I long to encourage autism parents and empower all to see inclusivity doesn’t have to be difficult - it can be beautiful. Like what you see? Sign up here to receive news and occasional freebies just for insiders.